The camera on top of the steering column monitors the driver’s attentiveness. For automakers and technology companies working on autonomous driving technology, making vehicles perform well in inclement conditions such as snow or fog remains a persistent challenge. But it turns out even a little sunshine can flummox emerging driver-assist systems. 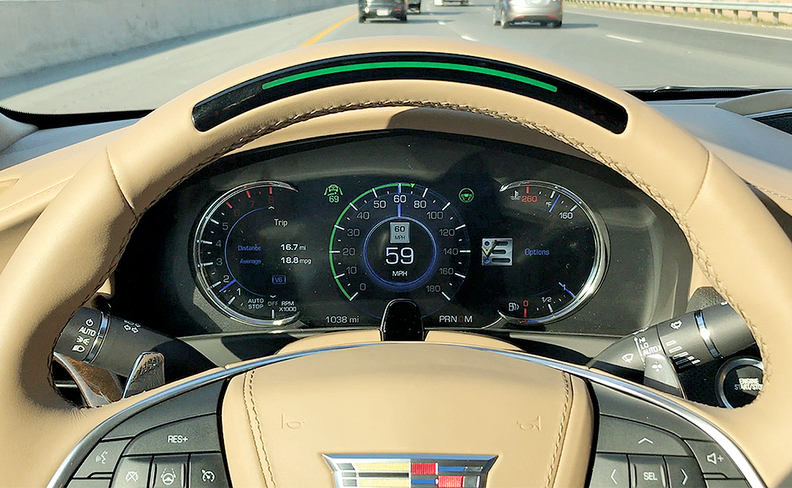 Take Cadillac's Super Cruise system, the hands-free driving assistant that can navigate most U.S. highways on its own, as long as the driver stays attentive. It's considered the most robust system on the market in terms of reliability and safety, and yet it continues to have problems when sunlight causes it to abruptly disengage. The issue, which has persisted since Super Cruise was launched on the 2018 CT6 sedan, involves sunlight blinding the infrared camera that's mounted atop the steering wheel column. The camera is a critical part of a system that monitors the driver's attentiveness. "Just as the sun makes it hard for you to see what's ahead of you, it does the same thing for a camera," said Sam Abuelsamid, an engineer and Navigant Research analyst. "It is a challenge." General Motors isn't alone in facing this problem. All automakers that offer such systems will have to find a solution — particularly as they devise driver monitoring systems. It's one example of the fickle nature of such systems and the challenges facing engineers as automakers strive to perfect autonomous vehicle technology. Fixes for Super Cruise's sunlight problem will be part of "significant changes" coming in the hardware for the next-generation system, said Daryl Wilson, GM lead automated-driving engineer. "We are learning from this, and we're going to make that availability much more robust in those situations," Wilson said. In May 2018, GM updated the driver monitoring system to perform better when sunlight hits the camera from the side. But a solution for direct sunlight isn't so simple. Abuelsamid said he believes GM will have to change where the camera is mounted or possibly install some sort of filter or diffuser that allows the camera to see better. "That's not something they're going to be able to fix with software," he said. "That's a flaw in the physical design." The camera-based driver monitoring system is what distinguishes Super Cruise from the competition and allows Cadillac to bill it as hands-free. Other systems require drivers to check in periodically by touching the wheel. GM has been conservative in its rollout of Super Cruise, which is limited to single-lane driving on roughly 130,000 miles of limited-access freeways in the U.S. and Canada that have been lidar-mapped to assist the on-board system. Rather than promoting it as self-driving or autonomous technology, Cadillac stresses that it's a hands-free driving system. GM updates the maps at least once a quarter and has implemented two major software updates since the system was launched in late 2017. The updates have included changes to the driving dynamics of the system, improvements to its user interface and the addition of 15 new messages to give drivers more information about why Super Cruise is not available in a particular circumstance or why it shut off, among other things. Other expected updates — potentially on the next-generation Super Cruise — include expanded capabilities such as lane change assistance, where the vehicle would change lanes when signaled by the driver. "Things like lane changes and some of the much more intermittent features that would benefit the customer … were absolutely looked at as desirable but at a lower priority than that foundation of being able to remove their hands from the wheel," Wilson said. Tesla has offered lane changing for several years on its Autopilot system and introduced other more advanced features such as freeway exiting and Navigate on Autopilot, which integrates Autopilot with the navigation system to guide the vehicle along its highway journey, including taking exits proactively. But Autopilot has come under growing scrutiny following a string of crashes in which Tesla drivers said the system was engaged and reports of drivers misusing the system. Abuelsamid said safety redundancies are key for all driver-assist systems and autonomous vehicles. "You need to have multiple different types to make a really reliable system," he said. "These systems are progressing. They're getting better. Increasingly, the industry is moving toward using driver-monitoring systems like Cadillac has done."